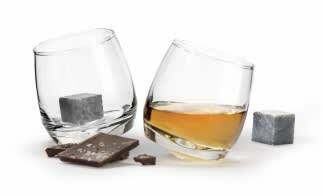 Two fun whisky glasses and two large cooler cubes that will keep your drink cool without diluting it with water. Just pop the cubes into the freezer and drop them in! The rounded bottom on the glasses means they swivel your drink around unaided by Sagaform. Dishwasher safe.